The St. Cuthbert’s Mission/Pakuri Martial Arts Academy with 14 members, lead by instructor Ryan Daniels, was officially launched by Shihan Abdool Nazim Yassim and his team on January 23, 2016. Members of the team that travelled for the launch and students of the St. Cuthbert’s Mission/Pakuri Martial Arts Academy take time out for a photo after the launch. 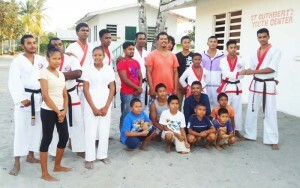 The Toshao of that Community in his remarks praised the Little Diamond Int’l Martial Arts Academy’s efforts to instill discipline in the young people’s life as he welcomed the effort to bring back martial arts/karate to that community; making mention of the importations of martial arts in the lives of not only the young but also the aged. He also commended 7th Dan Grandmaster Nazim Yassim for his dedication to the development of the youths of that community and urged him to share his Taiji knowledge with the older members, himself and others willing to learn. As many members and parents are happy with the idea, thinking about their health. Special demonstrations were done by Shihan Nazim and his team and members of the Pakuri martial arts academy. The LDIMAA Team that travelled to the Mission; Parsuram Arjune, Tadious Edun, Marlon Ignatius, Umisha Parasram, Moses Ignatius, Vikash Somwaru, Mrs. Marcell Yassim, Christian Freeman and Shihan Nazim Yassim.